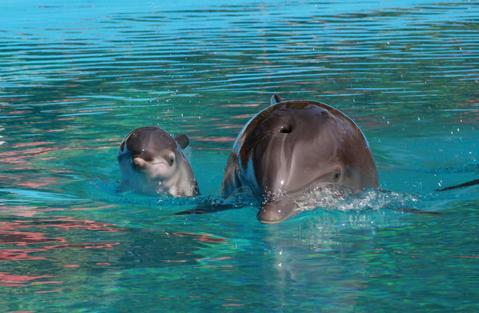 During Spring of 2017, I started to receive reports that at least one of the dolphins at the Mirage was pregnant. 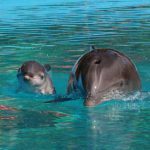 On July 17th 2017, local news reported that Huf-N-Puf gave birth to a female dolphin calf at the Mirage. The father was Lightning. This is their third calf together. Her siblings are Bella (born 2008) and Miramar (born 2011). The name was released to the public in September 2017; “Coco”. She is being kept with Huf, Duchess, and Bella in the birthing and research pool. 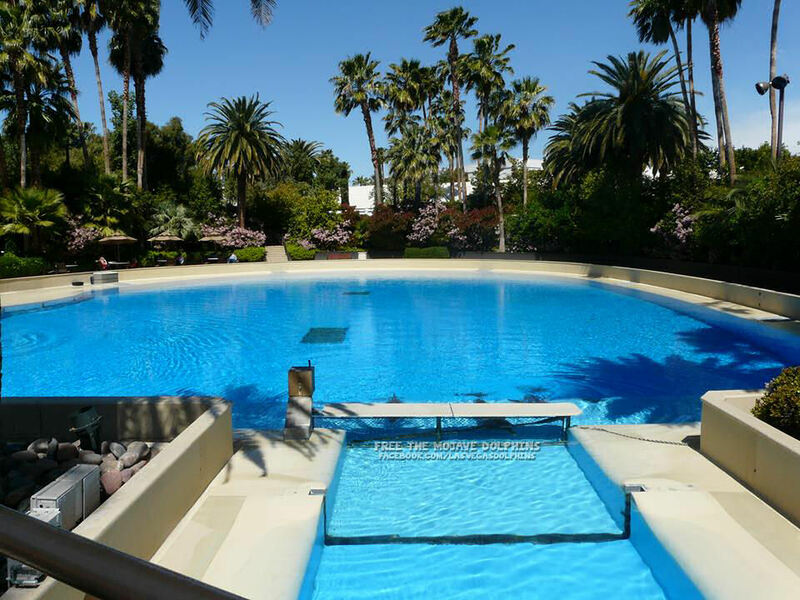 This is the large pool in the rear. Coco was named after MGM’s employee philosophy which is “One Company, One Culture”. This is the same company that keeps her and the rest of the Mojave pod confined under extreme temperatures with absolutely no escape from the sun. The foliage around the pools provides very little shade, and only during certain times of the day. Las Vegas had nearly 60 days this summer where we reached at least 105f or higher. In the wild, dolphins have the ability to swim deep beneath the surface, protecting their skin from being sunburned. 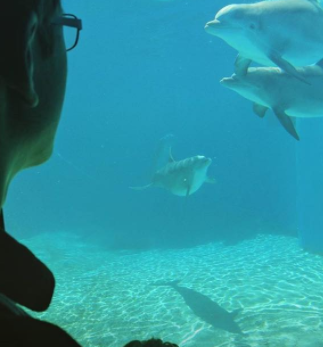 Dolphins at the Mirage spend the majority of their time lagging at the surface, chewing at the gates, and waiting for food. Coco’s life will be no different than the rest of the animals here in Las Vegas. She will spend her days swimming around the tiny pool with artificial coral awhile tourists point and smile at how “cute and happy” she must be because they can see the rather unfortunate way her anatomy forms her mouth. Overtime she may pick up one or more stereotypical behaviors of captive dolphins; waiting at the gates, biting the gates, or beaching herself. You can call MGM corporate at 1-(702)-891-1844 directly to tell them you will boycott until they shut down the dolphin exhibit. You can also contact the Mirage Hotel to voice your concerns at 1-(702)-791-7111. Join us in October as we protest outside of the Mirage Hotel for ALL animals held within their backyard. October 21st 10am-12pm. 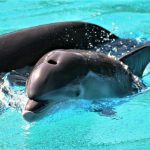 Freedom Matters: Protest captivity at the Mirage Las Vegas!